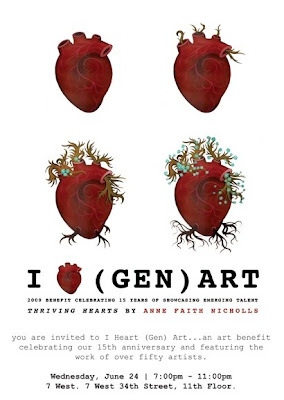 ‘I Heart Gen Art: 15th Anniversary Benefit’ will feature an exhibition of works from over 50 of today’s most exciting artists including the likes of Camilla d’Errico, Kris Lewis, Tony Philippou, Sarah Joncas, Brandi Milne, DJ Spooky, Claw Money, Ricky Powell w/Daze, Martha Cooper, Nathan Spoor, Caroline Hwang, Chris Mendoza, Kime Buzelli, Anne Faith Nichols, Dan May, Amir H. Fallah, Erik Otto, AIKO, and many more. A full list of all participating can be found here. All of the original works of art for sale fall in the range of $125 to $5,000, so be sure to attend and be ready to add to your collection. All proceeds from the evening will benefit the Gen Art Foundation, whose ongoing mission is to support undiscovered talent and providing a platform for emerging artists to garner increased exposure to a loyal audience. This event, and the raising of proceeds in connection with it, is critical to Gen Art’s survival through this summer.